We installed this solution on CRM Online organization but I believe this can also be imported to an On-Premise organization. A new option “What’s New” added to the Workplace. Lets first configure the entities to start receiving feeds from them. You need to create a new Post configuration record through the Activity Feeds Configuration option. You need to create one record each for each entity that you want to setup for Activity Feeds. 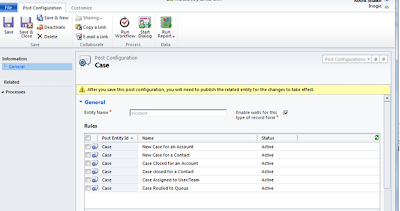 In the entity name you need to enter the CRM entity logical name. So instead of Case, you would enter incident. After you click on Save, you will find the Rules auto-created for this entity. I understand that these rules are predefined and there is no option to create a new rule. Also these rules are only available for certain entities. When I create a record for account entity, no rules were created for them. 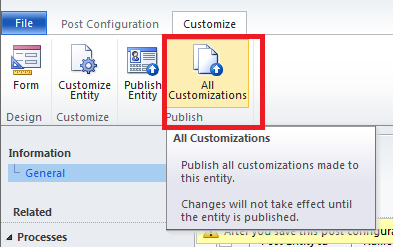 For this configuration to take effect, you need to click on the All Customizations ribbon button. This will publish the entity customization for the set entity. 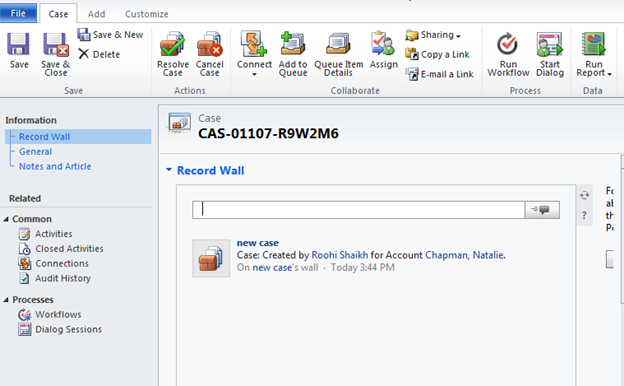 In our case, when we click on the All Customizations, it will modify the Case entity form to add the Record Wall. If you have multiple forms designed for an entity, the publish fails. Once an entity is set up for activity feeds, you can then open any record for that particular entity and click on Follow to start receiving updates for that record. 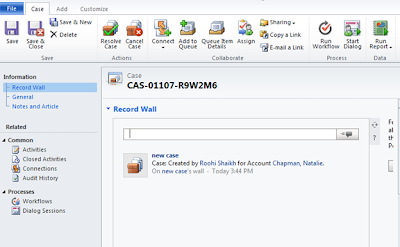 With the auto-feed rules automatically created for the case entity, each time a new case is created or any of the actions on the case is performed that is being tracked by the activities feed, an update would automatically be posted for the Case on the its wall and would also be reflected on the wall of the users that follow that record. You can also follow the feeds of another user. For this you need to open the User record and then click the follow button on the user record wall to start receiving updates posted by that user. You are now set to collaborate in CRM on different CRM entities including custom entities!